Home / SkinCare / Majestic Pure 24K Gold Body Scrub and Facial Scrub. Majestic Pure 24K Gold Body Scrub and Facial Scrub. 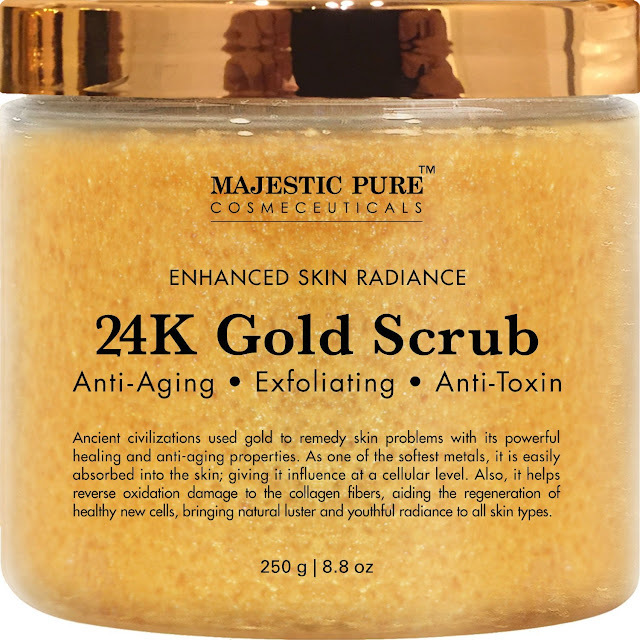 Majestic Pure 24K Gold Scrub is expertly formulated to moisturise, brighten, and intensively repair skin; made with REAL 24K GOLD foil which was highly used in anti-aging skin care solution. Egyptians believed the healing powers of gold could cure all manner of physical, mental and spiritual ailments. Romans used gold preparations for treatment of skin lesions and sores. Cleopatra wore pure gold for a radiant complexion. Gold was used by ancient civilisations to remedy skin problems. Gold is one of the softest metals and is easily absorbed into the skin; thus influencing it at the cellular level. It also helps to reverse the oxidation damage to the collagen fibres, which in turn accelerates the regeneration of healthy new cells. This body and face scrub provides a natural luster and youthful radiance to all skin types. 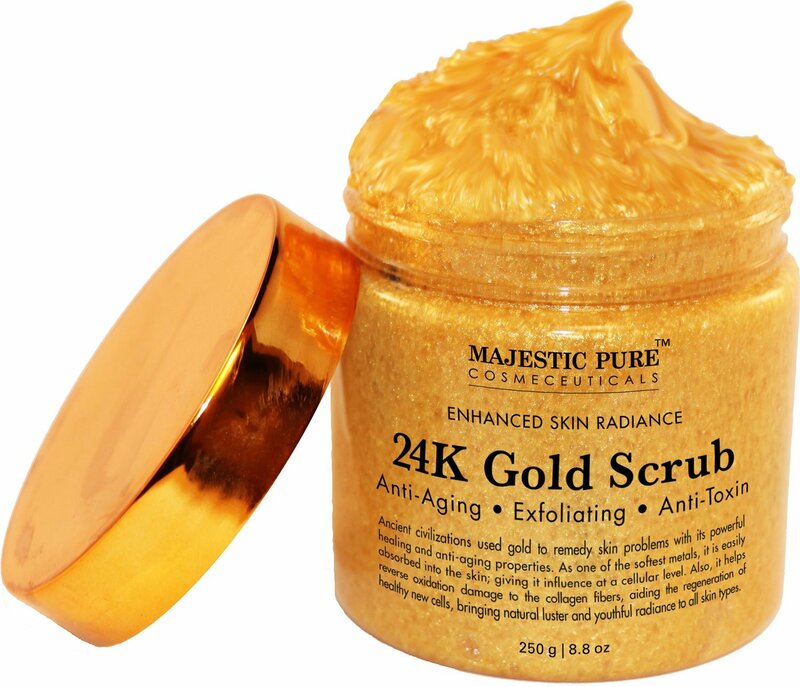 The 24K Gold Body Scrub and Facial Scrub from Majestic Pure arrives and is situated in a tub with a gold screw off lid. Once you unscrew the lid, you will find a little spatula and a plastic cap over the contents of the scrub to help keep the contents in place in the container. The label on the front clearly describes this luxury scrub with also details the ingredients and directions on how to use. It is advised to test a little on the inside of your elbow before full use to eliminate any adverse reactions. 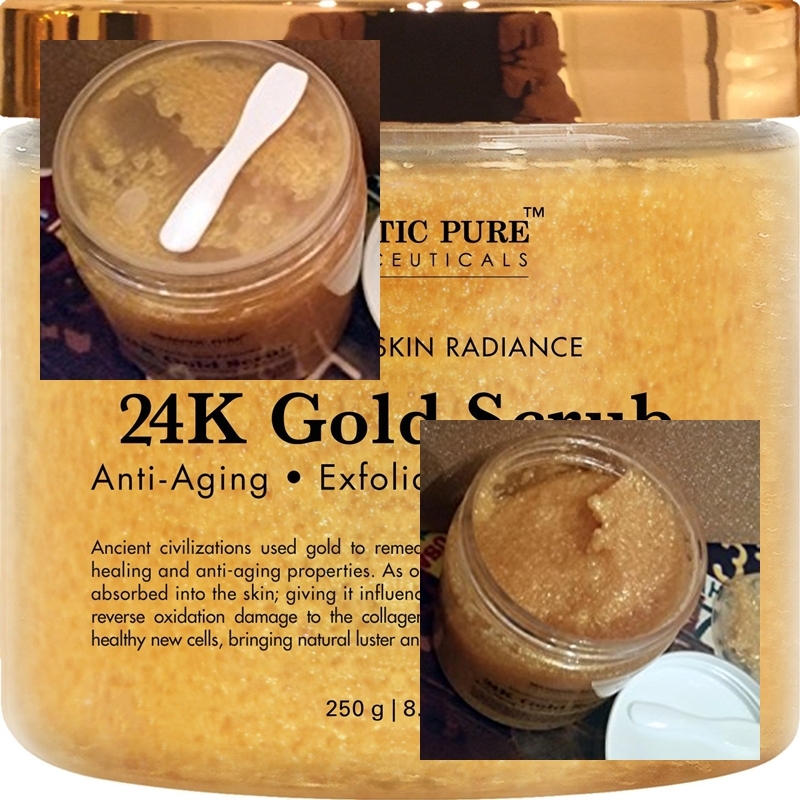 Majestic Pure 24K Gold Body Scrub and Facial Scrub is expertly formulated to moisturise, brighten, and intensively repair skin. It is made with REAL 24K GOLD oil which was highly used in anti-aging skin care solution. Increasing the smoothness of the skin; promoting cell proliferation and wound healing; and a soothing, anti-irritant, and skin protectant effect. Sugar ( which is the grains in the scrub. Cereus Grandiflorus Extract is an extract of the flowers of the cactus. Peony adds moisture to bring relief to dry itchy skin. Basic antioxidant properties that everyone needs to block free radicals from the body, which play a large part in the ageing process. Egyptians believed the healing powers of gold could cure all manner of physical, mental and spiritual ailments. Before using, you mix the contents with the provided spatula, to evenly distribute the oils and contents before application. Applying to wet skin, massage gently to buff away the dead skin cells and then rinse. You do have to be careful using in the shower or bath as it can make the surface of the bath or shower slippery from the oils. I have used it on my body and face and each time it has been a luxury product to use, as its feels quite moisturising thanks to the oils but also the sugar grains are great for exfoliating, just be careful using it on your face as they do feel gritty, like they are meant to be, but you might overdo the exfoliating on your face so start off by using a tint amount and remember only use twice a week! Another great plus point about this product is that it is not tested on animals! You only need a little of the product, so i can see this lasting awhile and leaves your skin smooth whilst also feeling moisturised! If your looking for a luxury high-quality scrub to achieve a radiance skin boost, then i highly recommend you try Majestic Pure 24K Gold Body Scrub and Facial Scrub and add it to your skincare collection! X Neil.